No swatches for Sally Hansen Insta-Dri Lightening yet! 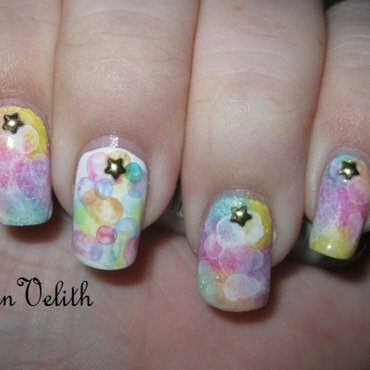 I have a bunch of pictures of old nail art that I've done from several years back while I was still learning. They're taken with a crappy webcam. So I decided to select a few that I really liked and try to recreate them and do them even better. 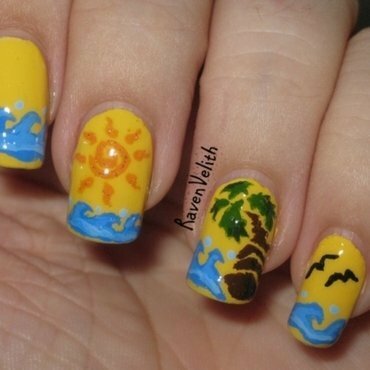 The original I did of this was inspired by a tutorial by cutepolish. 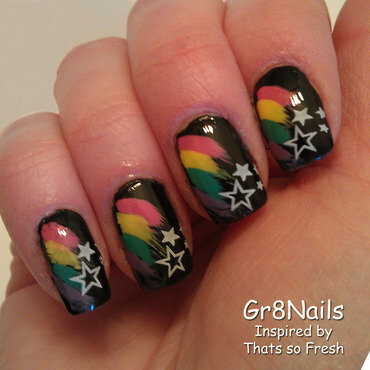 This time, I did a full rainbow on the nails. My original accent was red, but to make it more cohesive, I used a design I saw by bdettenails and just kind of reversed the others. The star studs I got from BornPrettyStore. This is my contribution for week 7 of the 52 Week Challenge, with the theme of Summer. I was going to do something typical involving sunset and shadows, but decided against it. Then I wanted to do something involving Kirby to pay tribute to Iwata Satoru who had just recently passed away, but I couldn't figure out how. Then I found a graphic on google that inspired me to do this instead. The details are all acrylic paint.